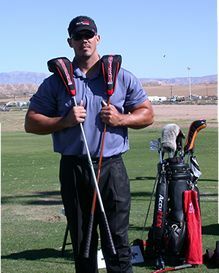 MIKE DOBBYNS has been competing in Professional Long Driving since 2003. He has qualified for the RE/MAX World Long Drive Finals every year since competing in LDing! His first year out Mike WON on the Professional LDA Tour! This year, Mike made the Final Television 8, which will be televised on ESPN ...check local listings for time. JAMIE SADLOWSKI has been competing for 4 years as a Junior and just turned 18! Jamies record in RE/MAX Finals is 2nd, 2nd, 1st and 1st! In repeating this year as Junior RE/MAX LD Champion Jamie <?xml:namespace prefix = o ns = "urn:schemas-microsoft-com:office:office" /> accomplished something that no one else has ever done at any level............Jamie holds the longest WINNING Drive in RE/MAX LD Finals history with a Blast of 420 yds.! He also set a new record in RE/MAX LD Drive Finals history with a Blast of 437 yards! That is the longest Finals hit ever in a Finals competition! Jamie finished 9th in the World at this years RE/MAX LD Finals! JOHN DOWNEY has been competing in Professional LDing for 9 years and has only missed the Finals once! Johnny D. has the best record in 2006 of any LDer going into the RE/MAX Finals by not only WINNING the biggest Professional LD event in the World in 2006. But, also setting this following record in 2006...'Johnny D. finished in The Final 6 at every PRO LD event (12 events) in 2006 and 2005! No one has ever set that kind of record in LDing! So what do Mike Dobbyns, Jamie Sadlowski and John Downey have in common? THEY ALL HIT GEEK GOLF CLUBS by AlmoDesigns! AlmoDesigns have WON 7 RE/MAX LD Finals Titles.....That is a record for components! SO..............Isn't it time you.........."RAISED YOUR GEEK FLAG HIGH"!